Lung cancer is a malignant tumour that grows in one or both of the lungs. Cancer that starts in the lungs is known as primary lung cancer and from there it can spread to other parts of the body such as the lymph nodes, brain, adrenal glands, liver and bones. If however, the cancer began somewhere else and eventually spreads to the lungs it is known as secondary or metastatic lung cancer. 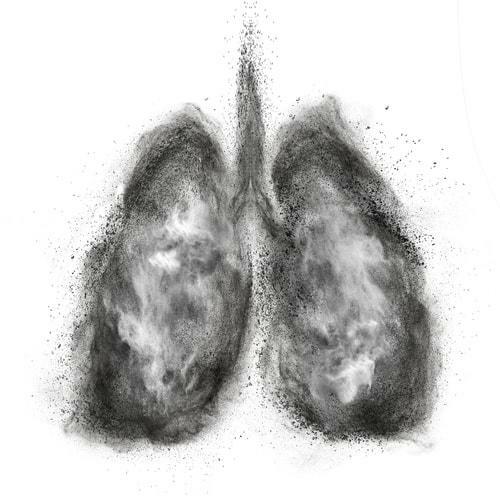 Small cell lung cancer (SCLC) accounts for 15-20% of diagnosed lung cancer cases starting in the middle of the lungs and usually spreads more quickly than NSCLC. Other cancers can also start in the space between the lungs or chest wall however these are not strictly lung cancer and are rare occurrences. About 11, 000 Australians are diagnosed with lung cancer every year making it the country’s 5th most common cancer accounting for nearly 9% of all diagnosed cancer cases. The average age at diagnosis in Australia is 71 and it is more likely to affect men than women. The chances of men being diagnosed with lung cancer before age 85 is 1 in 13 compared to the 1 in 22 chance that women have. Accounting for 9 out of 10 diagnosed lung cancer cases smoking is by far the biggest risk factor of developing lung cancer. The risk is also significantly affected by the age the person was when they started smoking and the number of cigarettes they smoke a day. People who have never smoked but have been exposed to other people’s smoke are 20%-30% more likely to be diagnosed with lung cancer compared to those who have never smoked or never been exposed to smoke who have a 0.5% chance of developing lung cancer. The risk of developing lung cancer is increased if you have a family member that has been diagnosed with lung cancer or you have been previously diagnosed with another lung disease such as lung fibrosis, chronic bronchitis, emphysema or pulmonary tuberculosis. Lung cancer is more commonly diagnosed in those aged 60 or over however it can still affect young people. Those who have been exposed to asbestos have a greater chance of developing cancer, particularly pleural mesothelioma. Exposure to other elements such as nickel, steel, chrome and coal gas may also be a risk factor as well as exposure to radiation or diesel particulate matter. In the early stages of NSCLC, stage 0 to II or sometimes III, surgery may be a viable option to remove the tumour. If lung function is good and the cancer has not spread to other parts of the body the doctor may be able to remove some or all of the affected tissue to help cure the cancer. Some people may receive radiotherapy as their main treatment for lung cancer, after surgery to help kill any cancer cells left behind, before surgery to shrink the tumour or to help relieve the symptoms of advanced lung cancer. Chemotherapy may be used as the main treatment for stage IV NSCLC or as additional treatment after surgery to help kill microscopic cancer cells that remain but cannot be detected or before surgery to help shrink the tumour. About 30% adenocarcinomas (a type of non-small cell lung cancer) are caused by a mutation of the epithelial growth factor receptor (EGFR) within the tumour. A number of different mutations have the same effect of ‘driving’ the cancer to get bigger. Certain treatments are available which are targeted to switch off that stimulus and control the cancer. Immunotherapy can be used to treat some forms of NSCLC. Medicine is used to help boost a person’s own immune system to attack the cancer cells that have developed. A person may have also experienced symptoms such as fatigue, weight loss, hoarse voice, wheezing, difficulty swallowing, and abdominal or joint pain. These symptoms are often vague and as such means that lung cancer is not usually diagnosed until it has spread to other parts of the body so it is important to get these checked, particularly if you already have an increased risk such as you are a smoker or older in age. If you have concerns about symptoms you are experiencing, consider speaking to your GP for a referral to see one of our qualified Oncologists at Hunter Valley Oncology.